View from The Shard & Thames Rockets Tickets - it's dizzy, it's fast, it's furious! This is one of our ultimate sightseeing packages – save 17% with offers on tickets for View from The Shard & Thames Rockets. Experience The Shard - Western Europe’s tallest skyscraper from a dizzy height, then come crashing back down to earth on a Thames Rockets Break the Barrier experience – a fast and furious speedboat ride on the Thames! Boarding at St Katharine’s Pier in the shadow of the iconic Tower Bridge, you set sail to a rousing “Best of British” soundtrack from iconic music to the unmistakable voices of Winston Churchill, Peggy Mitchell, Del Boy, and many more. Before you know it, we let rip! Pushing speeds of up to 30 knots (35mph!) the 12 metre long aero-dynamically designed fiberglass ‘Thames Rocket’ will twist and turn its way east flashing past Canary Wharf, the Cutty Sark, Greenwich and the O2 arena. There’s a chance to catch your breath as the vessel cruises through the marvel that is the Thames Barrier, before ‘Pulling G’ and firing up the 630hp engines to blast you home. Please advise your preferred entrance time for The Shard. Please advise your preferred tour time for Break The Barrier. Time slots are available every half an hour. Please advise your preferred entrance time when booking. Once at the viewing platforms the experience is enjoyed at your leisure, with no time restriction on your stay. The View from The Shard is currently bookable until the end of December. 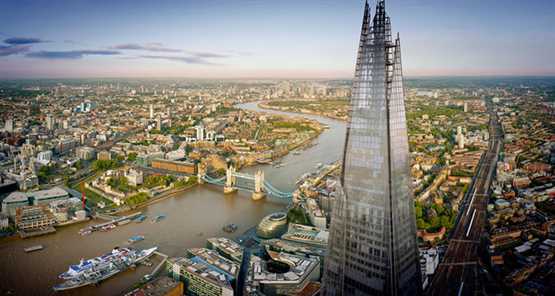 The View from The Shard is located within a few minutes’ walk from London Bridge Underground Station (Northern and Jubilee lines) and London Bridge Station (Southern and South Eastern trains). When exiting the underground station, follow the signs for The Shard or Joiner Street. If you are exiting from London Bridge Station, turn left and go down the escalator, this will take you to Joiner Street where our entrance is located. Departs from and returns to St Katharine's Pier. Booked this trip for our friends 40th birthday. Rory and Rich were fantastic host's and made the trip fun and enjoyable. I fully recommend this trip to anyone and give it a 5 star rating. Both experiences were great but times were changed the day before which meant we didn't get to go up the shard at our preferred time. Amazing boat ride, not at the time we specified, but thrilling, fast and educational. Cold though as we were given a late time. Would have loved to do this at the times we wanted but good value and good fun package. The View from The Shard was stunning. The Shard office doesn't open until 10 so just wait outside the big gates at the bottom. Thames Rockets were fantastic, excellent staff (2 x Mikes). Great to see the Thames barrier. We would definitely do this trip again. Incredible views from the Shard and an exhilarating RIB ride on the Thames! London is an amazing city, to see it from so high with 360 degree views was unbelievable. Beautiful interior décor with plants and flowers, the most charming and amazing experience was enjoyed by us both. we even got to witness Tower Bridge in its operational and stunning best. We then boarded the Thames Rocket One RIB for an amazing 45 minutes on the water. High speed excitement and views of East London at its finest, led in total safety by Skipper Mike and `Little` Mike, we were given an educational treat from Tower Bridge to the Thames Barrier. Highly recommend these two attractions. Thank you for being so helpful in helping me book this for my son and his partner they had a great day and a fantastic experience. Break the barrier was great fun and the crew were excellent and informative. Despite the inclement weather our experience, spirit nor clothes were dampened! Great way to see the eastern reaches of the Thames. The Shard was simple to access with good information and break taking views. Wow!! Hold on to your hats!! Break the Barrier was truly breathtaking. The crew were exemplary; warm, welcoming & witty. Little Mike being the very informative & excellent tour guide & the speedboat driven by the 'Stig Of The Thames'- Nick. Wonderful way to see the Thames & thrills along the way. View from The Shard - after our earlier exploits, this was an altogether calmer experience. The building itself is phenomenal - its all polished chrome & glass, very smooth.... The queuing is fast & after 2 elevators to the 69th floor prepare to have your breath taken away..... For more thrills ascend another staircase to the 'open deck' & enjoy a beer, champagne, or even something stronger to counteract that 'wobbly leg' feeling!! Jaw dropping sights across 360 degrees of London albeit a little chilly - but what do you expect....amazing experiences, truly unforgettable!! Well done to all - great staff & well looked after!! Please note that tickets are strictly non-refundable and non-transferable once booked. All images for for illustration purposes only and do not necessarily represent the event. In the unlikely event that you can't see at least three of the following landmarks - London Eye, St Paul’s Cathedral, Tower Bridge and One Canada Square - on the day of your visit, The View from The Shard will issue each member of your party with a ticket to return for an additional £5 within three months. To claim your free return visit, speak to a staff member at the ticket desk on level 1 on the day of your visit. Great way to celebrate our youngest son's 18th birthday. The RIB trip was fantastic, well organised and great fun, don't expect too much history or information, this is about speed and an amazing view of London by boat. It was great to see the Thames Barrier up close. The soundtrack is well chosen and good fun, and our crew were very cheerful and helpful. The View From the Shard is as good as everyone says, you can see all of London. We went up in daylight and stayed as the sun went down so it was lovely seeing all the lights come on below. Memorable trip all round! My partner and I decided to pop up to London for a weekend and wanted to actually do something fun as apposed to walking around the normal tourist attractions! We booked onto the 1400 Rib ride, and although it was later than advertised (due to an engine problem on the ride before ours) the experience was brilliant! The two tour guys were fab - funny yet knowledgeable of all the sights. Our visit up The Shard was phenomenal. We booked to go at 1600, so got to see the city during daylight and also nighttime. Watching the sunset up so high was truly magical! I would recommend both these events and discount-London.com to all my family and friends. Thanks for a great service! Did the view from The Shard which was fantastic. Also did the speedboat out to the Thames Barrier and back to St Katherine's Pier which was great fun. I'd bought the Highest and Fastest Voucher as a gift to my husband, would highly recommend. What a wonderful experience this was. Great fun, great excitement and perfect timing to see Tower Bridge opening just as we returned to the quay. James and Ian were wonderful hosts and the whole event was superb. Well done! My husband was given the gift voucher as a birthday present and we were very impressed with the whole experience from the help and advice we received while booking, to the friendly crew on 'Break the Barrier' who helped to make it such a great birthday. View from the Shard and Rib Boat experience. The Shard has an incredible view, slightly nerve-racking but once up high it was phenomenal. Very well run and refreshments available on different levels. The Rib boat was GREAT. We had Matt and Paul as our crew and they were good fun,careful of our safety and very good at providing a very fun trip. Speeding down the Thames like the clappers was amazing. Can definitely recommend both The Shard and the Rib Boat. Excellent day out. Very easy to book and pay. Good value for money London treat. Positives- whole booking process very good, well informed when my initial booking had to be changed. Shard experience was good, rib experience was brilliant fun , a great day and not a bad price Negatives - Customers should be made aware that there is no ticket office at the rib experience with no apparent signage either, when the ribs are out there is no indication of where to wait. Great adventure along the Thames! The RIB boat adventure was definitely the highlight of our weekend on London! Was great to see the "other side" of the Thames & fantastic sites- great soundtrack too! Great experience! The Shard experience is a slick and professional operation. Thanks to Andy and James for a great white-knuckle ride on the RIB, good interaction from the on board team greatly enhanced the ride. Highly recommended!